During the winter in northern states and in Canada, your car will be covered in snow and ice. There will be a buildup in the wheel wells on your car of slush. It is a mixture of snow, sand and salt which among other things eats away at your car. But also melts in your garage and lands on the floor. As the water evaporates your left with a mix of sand and salt deposits in a white powder like form. This white stuff is efflorescence. Efflorescence deposits on your garage floor do not look great. It can cause damage to any tools etc. that may be in your garage. This is salt after all and salt corrodes any exposed metal. How to Get Rid of Efflorescence Garage Floor Deposits? Washing the floor will help remove some of the material, however there is still a great deal that will be in the concrete and will also be in the cracks in your floor. Once your floor dries, the salts will reappear. The best approach is to use a brush with stiff fibers and sweep up all of the loose material and discard it in the garbage. You may need to do this several times to remove all of the material on the floor. If you have a leaf blower, this tool can get rid of almost all of the grit and salt left on the floor. Move your car and any other items that might obstruct the removal of the dust. I would move your car onto the street since there will be lots of dust in the air and you do not want it landing on your car. Start at the furthest point away from the garage door and blow all of the dust out the door onto the driveway and then onto the street or your lawn. This method does not cost anything and will get rid of any fine particles of sand and salt that is left after first sweeping the garage floor with a broom. There are lots of products on the market that advertised to deal with efflorescence garage floor removal, however this is the easiest and the least expensive method. In northern climates, cities and counties spread lots of salt on roads to melt the snow and reduce accidents. The salt gets on our cars and makes a mess of our cars causing them to rust and deteriorate. When we place our car in the garage, the snow and salt mixture melts. It drips onto the concrete floor seeping into cracks in the concrete. When the salt water evaporates it leaves a white powder called efflorescence. This is a very common occurrence. Especially in northern climates where a great deal of salt and sand mixtures are used to keep the roads from becoming too icy. 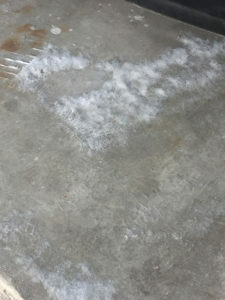 Many people wonder what this white powder on my concrete garage floor is. When the snow and salt mixture melts, it coats the floor with a salty brine. The concrete will absorb this brew like a paper towel, readily soaking up all of the moisture including the salt. When the water evaporates at the salt is left behind. It sits on the surface of your garage floor as well as in the cracks in the concrete. It is just find crystals of salt. Washing the white powder with water does not work. This will cause the salt to be absorbed by the water and driven into the concrete. When the floor dries again the efflorescence will come back. Even if you try to wash the floor several times the efflorescence or salt crystals will come back each time after the water dries. The best way to get rid of this fine powder is to use a fine broom and brush up the powder into small piles. Sweep the powder into a pile, scoop it up and place it in the garbage. You may need to sweep several times before it all is gone. Some consumers will use an electric blower to blow all of the dust and all of the salt, this salt mix together out of the garage and into the street. This just adds to the dust floating around in the air which eventually falls to the ground, on your shrubs, grass and even your car. My preference is to sweep it up with a broom as mentioned before and scoop it into the plastic garbage bag.